Open the can and take out a pouch. Close it up tightly to keep the remaining pouches fresh. Place the pouch in your mouth between your teeth and your lower lip. Decide which works best for you. There are many options and flavors. The term Chewing bags is used to describe smokeless products. Tobacco leaves are heated and moistened with steam and cut into smaller pieces and then used for our Chewing Bag products. The tobacco for Chewing bags are pieces cut with a length of 5 - 50 x 0.6-0.8 mm. The same great taste of Thunder but with a kick! Whether it is tobacco leaf or spun tobacco, these tobacco products have historically been known as Chewing Tobacco. 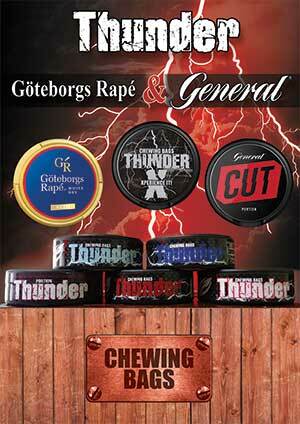 This can be misleading to the modern smokeless tobacco user: Chewing tobacco is not chewed like chewing gum. In practice, chewing tobacco is not even chewed that often. It is usually placed in the upper or lower jaw and not centrally in the mouth. Should the user wish to increase the speed of nicotine delivery and taste, they simply chewed one or two times lightly on the product before replacing it back against the upper or lower jaw with their tongue.